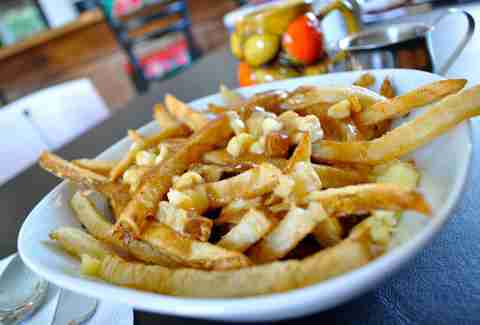 The best poutine in all of metro Detroit is at Rock City Eatery in Hamtramck. And that's not just because Nicole's Poutine is, in the interest of full disclosure, named for the author of this article. 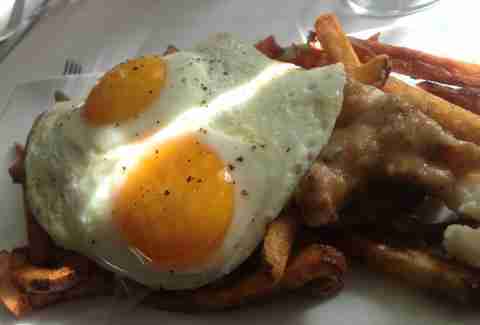 It's also because it features an outright decadent combination of duck confit gravy with cheese curds and an optional (but basically mandatory) fried egg over fries, and is exactly what poutine is supposed to be -- a bunch of really delicious slop on a plate. Leave it to genuine, bona fide Canadians to bring a proper rendition of this Canadian delicacy across the border. Order it traditional-style with hand-cut fries, organic cheese curds, and beef or mushroom gravy, OR go nuts and get the breakfast poutine with bacon or tempeh and a sunny side-up egg. They also have a vegan version, which we are told vegans enjoy, but cannot vouch for ourselves, obviously. 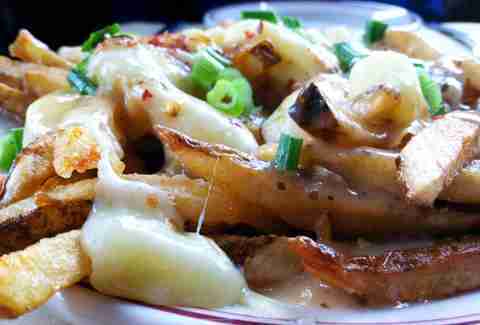 Before Americans' poutine awareness had been raised, variations existed across the country under a different name: "disco fries". At Vinsetta Garage in Berkley, they're made with house-cut fries, Ellsworth Cooperative Creamery cheese curds (out of Wisconsin -- legit), whole-grain mustard gravy, chili flakes, and scallions. In other words, it's poutine, with an ever-so-subtle spicy kick, and it is glorious. 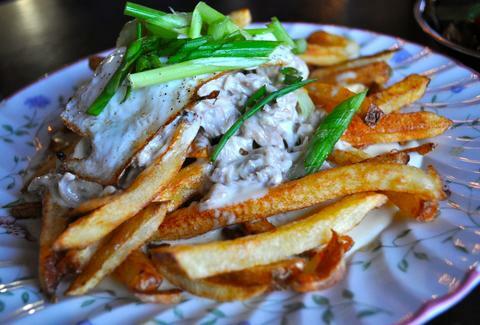 While Green Dot Stables wasn't the first place in the city to put poutine on the menu, they can certainly be credited with bringing poutine awareness to the masses at their ridiculously popular and ridiculously cheap bar in "Corktown Shores". Many a Detroiters' poutine cherry was popped by their Le Poutine, and at $3 per order it definitely made the uninitiated more open to poutine experimentation. For that, we are forever grateful. So pork belly is kind of a big deal right now, so it seems only natural -- inevitable even -- that pork belly and poutine should be combined. Behold, the pork belly poutine at One-Eyed Betty's, made with fresh-cut fries, curds, gravy, pork belly confit, and a poached egg. 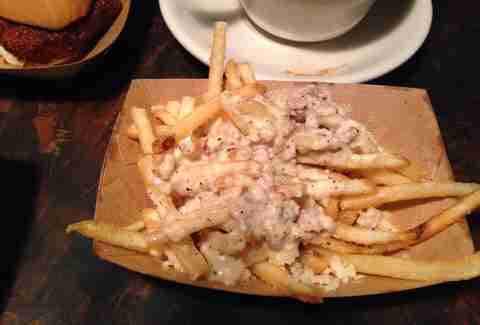 Thankfully Betty's has a gi-normous beer list, because you'll need it to wash down this massive trough of poutine. Spend a Sunday out in Ann Arbor and make your first stop Grange Kitchen & Bar for their breakfast poutine, made with duck confit, duck sage gravy, curds, and topped with two fried eggs. Two! Grange prides itself on diligent local sourcing so you can also take comfort in knowing that your breakfast poutine is helping the local economy in addition to your hangover. Which it is most definitely also helping. It's a food truck, it's a pop-up, and their Instagram pictures are really, really pretty -- which makes Stockyard a triple-threat of all the hottest things in Detroit right now. 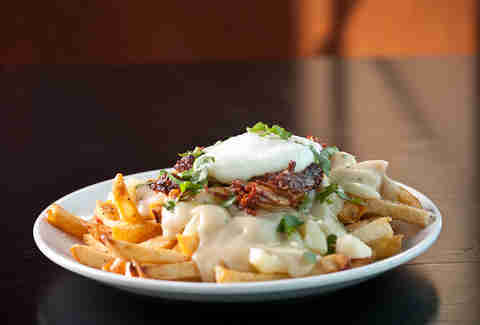 And their poutine is even hotter (ZING)! 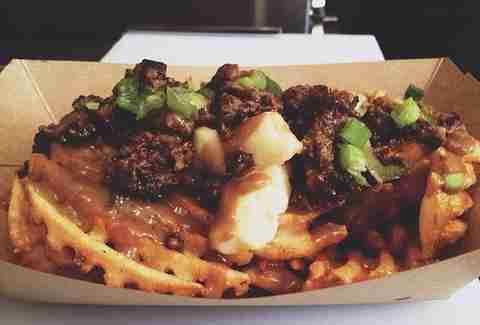 Their chorizo poutine is made with waffle fries, chorizo, gravy, cheddar cheese curds (they'll be using curds from Michigan's own Pinconning Cheese Company soon), and scallions. Follow them on Twitter to track their latest locations. Move over, coney dog, your days of being Detroit's signature dog are over. Well, probably not, but at least Detroiters have discovered something they can layer over a hot dog besides chili. 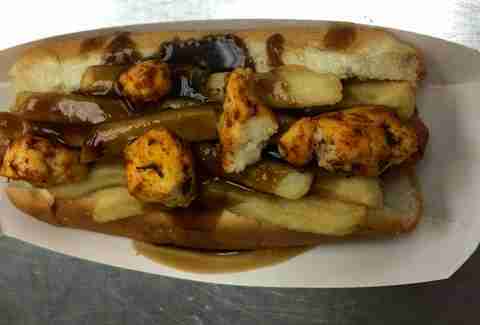 The poutine hot dog, a natural-casing frank covered with beef gravy and cheese curds that debuted this year at Comerica Park, is the perfect marriage of all things American (baseball! Tube steaks!) and Canadian (putting gravy and cheese curds on things!). Isn't it nice to see an international border city like Detroit being so very international? Sign up here for our daily Detroit email and be the first to get all the food/drink/fun Michigan has to offer.